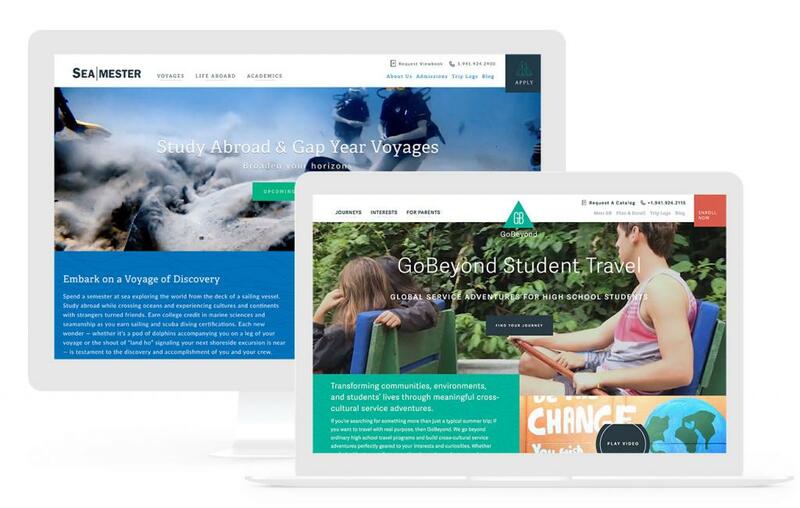 For a quick overview, Global Expeditions Group (GXG) is the parent company of the ActionQuest, GoBeyond, and Sea|mester student travel brands—all of which provide unique outdoor educational programs for teens and college students. With each program existing as a separate entity, GXG required a partner to design and implement a robust content marketing strategy across each brand yet maintain a consistent user experience and visual style. A wide-range of worldwide, cross-cultural community service journeys for high school students seeking to make a difference and go beyond just being a tourist. A three-month undertaking that allows college students to complete a full semester’s worth of academic classes while island hopping aboard modern two masted schooners. Three-week sailing adventures for high school students teaching the tangible skills of sailing, scuba diving, snorkeling, and various water sports. Our role as a strategic partner began with big decisions that go well beyond marketing each individual brand. With our experience in the industry to jumpstart our research—we dove in and quickly got up to speed with each brand’s value and pain points. After a series of meetings to understand GXG’s goals, we began answering questions and providing recommendations that surround folding offerings into more its popular entities, rebranding individual brands around a parent company, and how to prioritize both current and ongoing digital marketing efforts. 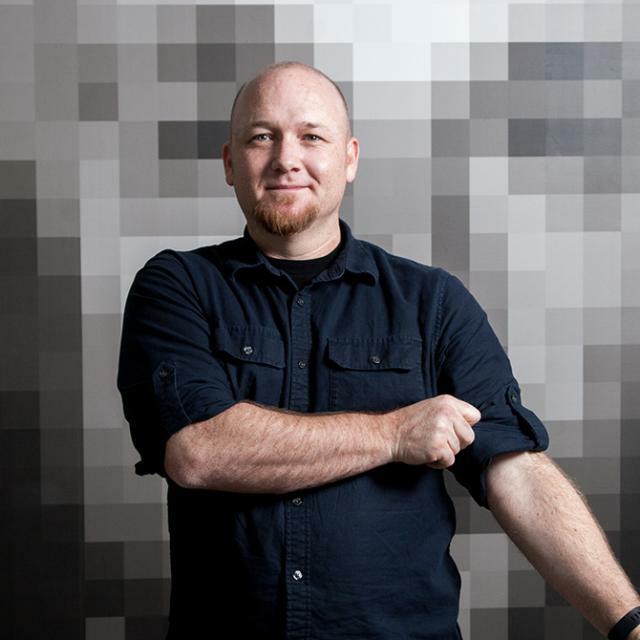 Essentially, we repositioned GXG’s products in the industry— and as a result we’re in the best position to make meaningful and accountable digital marketing decisions. …improvement in Bounce Rate six months after the launch of gobeyondtravel.com. …improvement in Average Session Duration (time on site) six months after the launch of gobeyondtravel.com. …improvement in Pages Visited six months after the launch of gobeyondtravel.com. 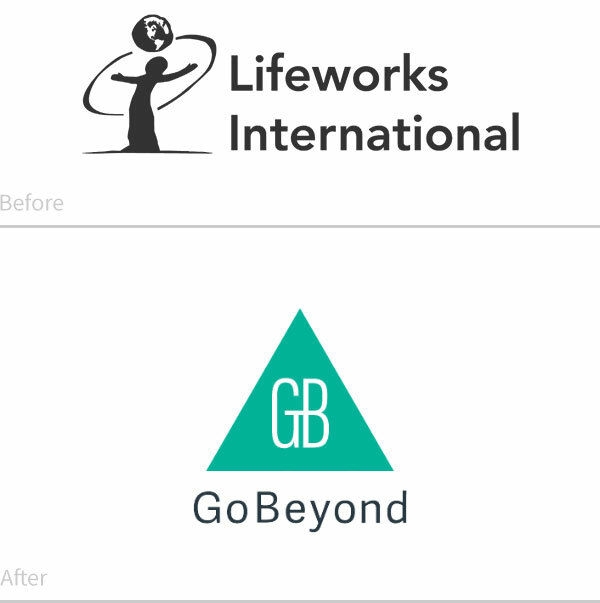 Our first challenge was Lifeworks International—which we rebranded to GoBeyond Student Travel. With the most opportunity for growth and general market confusion, it made sense to tackle some of the most glaring issues first and to work backwards from there. Following the rebrand and revised messaging guidelines, we designed the website from the ground up, laying the foundation to model information architecture and aesthetics going forward. Read on to see exactly how we put together the GoBeyond project. Research that tells the client what he or she already knows isn’t useful. We took the time to talk with the founders and team about their history, the current competitive landscape, and the potential for the brand. Then we got to work. Considering our initial challenge was not only to redesign the website, but also to completely overhaul the brand and positioning—we understood that our final product would only be as effective as our research had been. The following deliverables (both internal client facing) allowed us to be confident with our recommendations as we move forward to the strategy phase to inform both the rebrand and the website redesign. Lifeworks International is pretty different from the other GXG brands. Rather than focus on adventure and traveling, Lifeworks places students in underserved communities and environments throughout the world to volunteer and truly make a difference. That said, the Lifeworks’ name and dated mark was failing to resonate with many, and some even expressed a spiritual sentiment. 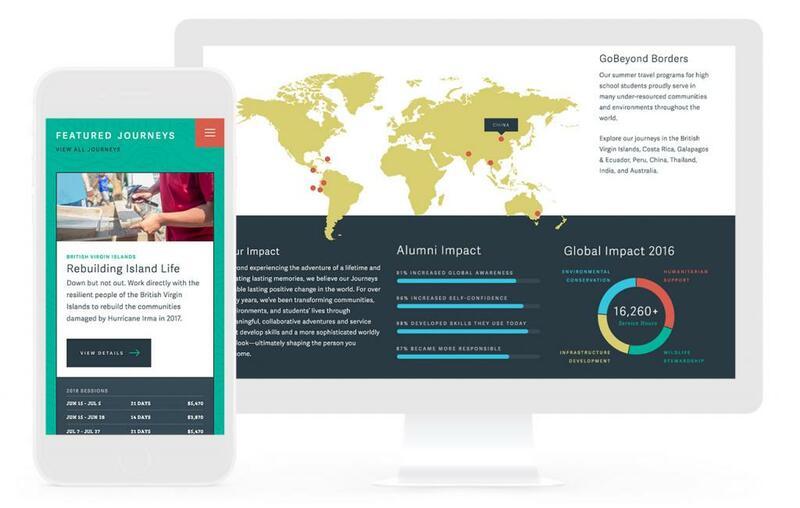 Lifeworks needed a name and mark that would not only communicate its unique differentiators, but would inspire high school students to embark on meaningful cross-cultural service projects in under-resourced communities throughout the world. After countless meetings, exercises, and even a collaborative workshop with GXG’s Marketing Team, we started exploring versatile terms that would empower students and prompt interest. With the draw for students—and their parents who foot the bill—being twofold (volunteering and personal growth), it was important we create a brand that could be used interchangeably to symbolize both the value to the student and the community. Transforming communities, environments, and students’ lives through meaningful, exciting cross-cultural service adventures throughout under-resourced parts of the world. Following the brand transformation, we were eager to put the rebrand to the test with a new website. With loads of data and stakeholder interviews under our belt, we began mapping out detailed userflows for each of our targeted personas’ buying cycles—a process that shapes the information architecture. Essentially, we “follow” hypothetical visitors around our initial sitemap drafts and page sketches to expose potential pain points and opportunities. 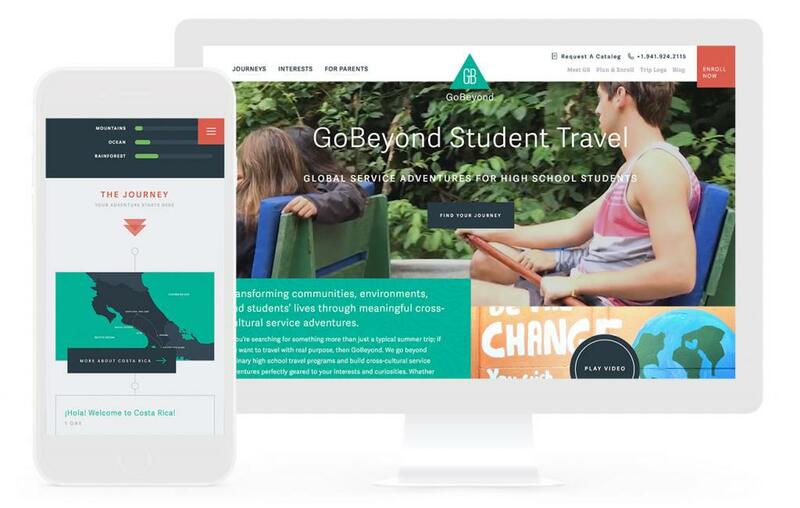 The result of GoBeyond is a refined site structure and content priority that feels natural to navigate whether you’re looking to improve your college application or simply want to make sure your child is going to be safe this summer. 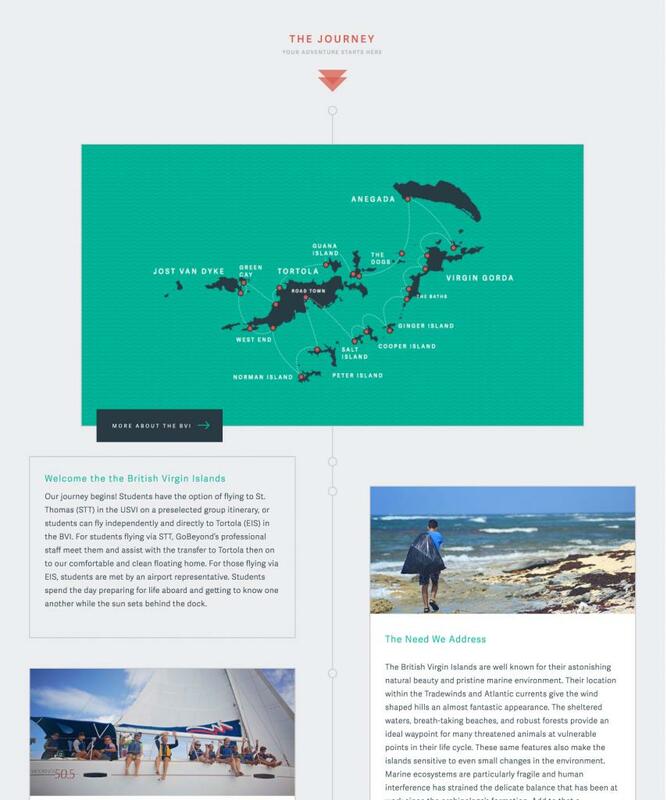 Page information can range from spoon-fed storytelling to a pure information dumps—depending on your needs as a user—so we created ways to not only tell inspiring stories but also to provide a ton of details without overwhelming with walls of text. As we progressed from whiteboards to wireframes a visual style started to emerge. Even our earliest sketches retained some of the most compelling aspects of the design, such as the custom icon-based filtering system and the “service focus” info bars. Using GoBeyond’s meaningful trips as inspiration, we spent a great deal of time expanding the limits of the rebrand to develop a vibrant yet consistent aesthetic. We paid close attention to the details, just as GoBeyond does in its service journeys—subtly communicating the dependability and meticulousness of GoBeyond and its adventures. Needless to say, our developers were challenged with this project. The ambitious design, complex filtering, and widespread animations—not to mention the backend usability and layers of content governance—were all obstacles our designers and developers solved as a team. Take, for example, the complex taxonomy of trip filterings. We provided users a means to narrow down results from five variants, including date range, which adds a degree of complexity. What’s more, if the client admin needs to add or edit these filtering systems in the future, the backend is extremely user-friendly and dynamic. Say goodbye to double entry and endlessly fiddling with the options. We build scalable systems that make it easy for inexperienced admins to manage and require as much “coding ability” as a simple word processor does. All this flexibility is made possible by building pages with content blocks (Gravitate Blocks), a drag-and-drop system to easily create and edit page layouts. While planning a web project, we begin designing specialized blocks and page templates for clients’ specific needs. 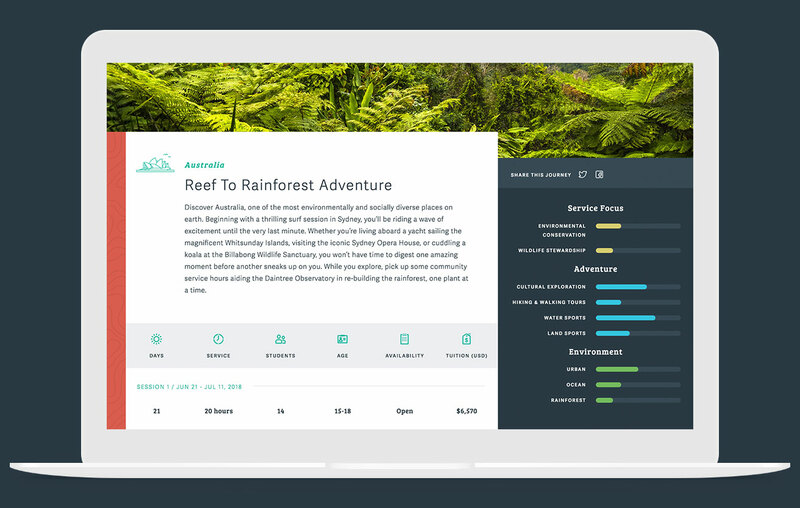 In this case, GoBeyond required a number of unique blocks, such as tabbed interfaces, interactive maps, and several types of tables and charts—all styled to support the design on the frontend and easily manipulated in the backend. 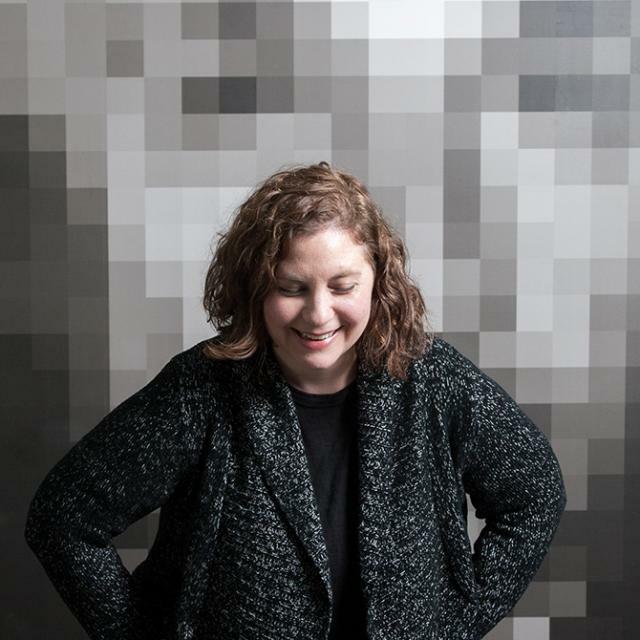 We view content strategy as the measurement and organization of ideas. Copywriting is the ground-level execution of those ideas. As such, with the structure and strategy set in place and a firm grasp on the new brand and messaging, we got to work writing copy for many of the high-level landing pages throughout the website. In other spots, we polished and took advantage of student-created content to give high schoolers, and their parents, a real taste of what each service journey entails. After GoBeyond launched we saw a nearly 50 percent improvement in bounce rate, a 60 percent boost in time spent on the website, and a 35 percent increase in the number of pages visited (per user). With those numbers directly equating to dollar signs for GXG’s team, they turned to us to redesign both Sea|mester and ActionQuest in the coming months.